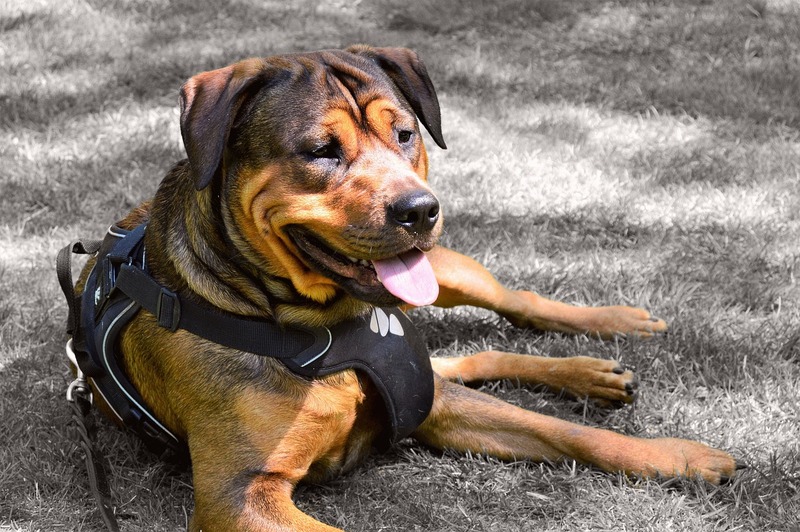 No one wants to be the person that has to see their dog suffering from heat stroke, but knowing what to look for can help you take swift and appropriate action to help your friend (or someone else’s) when they’re in trouble. Dogs can’t exactly tell us when they’re sick, in pain, or uncomfortable, so it’s up to us as owners to be on the lookout for discomfort in our dogs. If your dog is excessively panting — and panting hard — as well as drooling a lot, this can be the beginning stages of heatstroke. Heavy drooling is also known as ptyalism or hypersalivation. If your dog seems to be laboring for breath, this could be another sign that your dog is experiencing heatstroke. Put your hand on your dog’s chest. Does it feel like his or her heart is beating wildly out of control or even not to a consistent beat? In conjunction with heavy panting, drooling, and difficulty breathing, your dog might be experiencing heatstroke. Normally your dog’s gums, mouth, and tongue are a pinkish color. If you pull back your dog’s lips and you see that your dog’s gums are darker than normal — they may even appear purple-ish in color — he or she may be showing signs of heatstroke. If you see that your dog’s gums appear very pale and the tongue very bright, you could be witnessing the early signs of heatstroke. Cool your pooch down now! If you see your dog shivering, having trouble walking, or even walking around as if he or she is drunk, you should be more alarmed than amused. You’ll want to get your dog checked out as soon as possible by a vet. If your dog is lying on the ground, panting hard, and seems unconscious, and you can’t rouse him or her to get up, it’s a good sign that your dog needs help. Bring your dog somewhere cool ASAP and call your vet! Specifically, if your dog’s body temperature is above 103 degrees, your dog could be suffering from heatstroke. This can be harder to diagnose because chances are you aren’t going to rush to take your dog’s temperature — you’ll usually leave that to the vet. So keep a keen eye on the other symptoms first. You can see a full list of symptoms on PetMD. What should I do if my dog is showing symptoms? First — don’t panic! Nothing is helpful to anyone if you’re freaking out and can’t help your doggy friend. The first thing you’ll want to do is help your dog cool down. Bring him or her inside, to a shaded area, or ideally, into the tub. You’ll want to quickly cool your dog with water either in a tub, a pool, or with a hose. Don’t go for ice cold water as you don’t want to shock your dog’s system — instead opt for cool water. Make sure to pay special attention to the back of the head and neck of your dog. Your dog may have trouble keeping his or her head upright, so make sure you are aware and keep your dog’s head out of the water to keep him or her from inhaling water. You can also apply a cool pack (or frozen vegetables) to the back of your dog’s head to help them cool down. While your dog is cooling down, you can massage his or her legs to help with circulation and keep the risk of shock lower. Once your dog seems to be able to, let your dog drink as much cool water as they like. Even if your dog appears fine after that, you will want to bring your dog to your vet ASAP. Heatstroke can cause all kinds of unseen problems including brain and kidney failure. How are you keeping your dog cool this summer? Let us know in the comments below. Our dog is a handful on a leash! BlueDog does a great job giving him the exercise he needs during his long days home alone. We can’t thank them enough for their continued reliability and flexibility. We also love the journal about his daily walks! Amy has the challenge of not only training my headstrong beagle, Anna, but also my brother with moderate special needs. Getting the two of them to work together is no easy feat, but Amy is doing an amazing job!